I’ve been a long time user of Tweetie, first for Mac, then later on the iPhone. A few weeks ago, when Twitter bought Atebits, the developer of Tweetie, there was much concern that this spelt the death knell of the Mac desktop version, especially as this was (and still is) languishing at version 1.2.6 while the iPhone app had moved to version 2 with a couple of updates on top of that. A quick search on twitter showed that others were also noticing this. The problem is that both Tweetie for Mac and Tweetie for iPhone use basic authentication and are registered with the same token. (thanks to Matt Roberts) When Twitter changed the tag from “Tweetie” to “Twitter for iPhone”, it meant that both incarnations of Tweetie were being retagged, one of them wrongly. The conclusion is that either Twitter has overlooked the consequence of changing the tag or more worryingly that they really don’t care about Tweetie for Mac and are happy to have Tweetie for Mac users advertising an iTunes link to the iPhone app. Tweetie for Mac is however still available on atebits.com. While it’s great to receive updates for iPhone apps, these are not always welcome as the update can often change the app’s functionality dramatically, such as when Occipital were forced to removed the Amazon results from their otherwise excellent RedLaser app; for many, this was the main attraction for using RedLaser, so did not want to update. While you are not forced to do so, it means that you cannot use the ‘update-all’ button; you then have to individually install updates, which can be tedious with a large number of updates. It would be better to be able to opt to ‘ignore updates for this app’, but I can’t see Apple adding this functionality. Although there are several causes for reduced battery life on iPhones, I found that this was my problem with a rapidly flattening iPhone battery. When I first got my iPhone, I found that, after an overnight charge, the battery wasn’t even lasting until the end of the afternoon. The phone was also getting quite warm. I initially put this down to overuse of a new gadget, but even when I wasn’t using it much during the day it was still needing a top up to avoid it dying on the way home. Additionally, this didn’t happen at the weekend when I used the phone a lot more. I then noticed that while I was at work, owing to the perfectly reasonable company firewall settings, I couldn’t connect to my .mac* or gmail email accounts nor send any email. In order to do so, I would turn off the WiFi to use the GPRS (I’d be lucky to get 3G on O2 despite being inside the M60). I then found that the battery life improved so that the phone would now last all day until late evening. Basically, what seemed to be happening was that the iPhone was continually ‘banging its head against the firewall’. Rather than realising that it could not connect to the mail servers, it would continually retry, and in doing so and using the WiFi it was draining the battery. Obviously, as I stated at the opening line, there are several reasons for reduced battery life, but check that your iPhone is not needlessly wasting power on futile WiFi connections. Three dates for your diaries in the next two months if you live in Horwich or Blackrod. Horwich Carnival Races will be held this year on Sunday 20th June. Various running and cycling races for different ages and abilities, both serious and fun are held on the streets of Horwich and this year’s provisional timetable is here. A handful of photos from two years ago are here. This year’s festival promises to be the biggest ever, according to St. Katherine’s Church, the organisers of the festival. At the close of registration 89 scarecrows had been promised. You can pick up a map guide in Blackrod on the day. While the Carnival has in previous years been held on the same weekend as the races, this year it is on the same weekend as the scarecrow festival – 4th July. According to the Bolton News there will also be a record attempt at the largest number of zombies in a parade. Back in 1999, I bought a Canon IXUS L-1 APS camera in New York. Unfortunately, it only had eight films through it before I moved on to the Digital IXUS. While I’ve been scanning my old 35mm negs and slides using a Nikon Coolscan IV, I haven’t been able to scan these eight APS films without Nikon’s APS adapter. Even when the adapter was available, it did not make sense to spend £150 for the sake of eight films. Recently, I was searching eBay for any cheap APS scanners when I came across an advert for Karmaan who were offering to scan APS films for £3.95 each and also post-process them to remove the grain inherent in APS film, so for the sake of £35 (with P&P) I got them all scanned, one of which is shown below. I would recommend Karmaan’s service to anyone needing their APS films scanning. More of these APS scans are on Flickr. 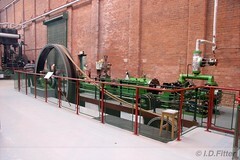 Bolton Steam Museum will be holding another of their open days on 30th and 31st May, where you can see their collection in full steam. Admission is free, although donations towards the running of the boiler are appreciated. More details here. More photos of the museum here.